"ELO are back in the news, with the revelation that Jeff Lynne is re-recording some of our classic hits. He's been working in the studio where, he says, he's been bringing the benefits of 21st century record techniques to songs we originally released in the 1970's. Among the tracks that will appear on a new album titled Mr. Blue Sky, due for release in October, are Mr. Blue Sky, Evil Woman, Strange Magic, Don't Bring Me Down, Turn To Stone, Showdown, Telephone Line, Livin' Thing, Do Ya, Can't Get It Out Of My Head and 10538 Overture - plus a new song called The Point Of No Return. But here's a memory of the early Electric Light Orchestra days, with Jeff and myself surrounded by Wilf Gibson, Mike Edwards, Colin Walker, Michael de Albuquerque and Richard Tandy." Bev is a nice guy. Most people in his position would have been furious at the idea of their contribution to a band's legacy being over-written in this way. Bev's clever enough to realise that the re-recordings will never replace the originals and so has no need to worry. 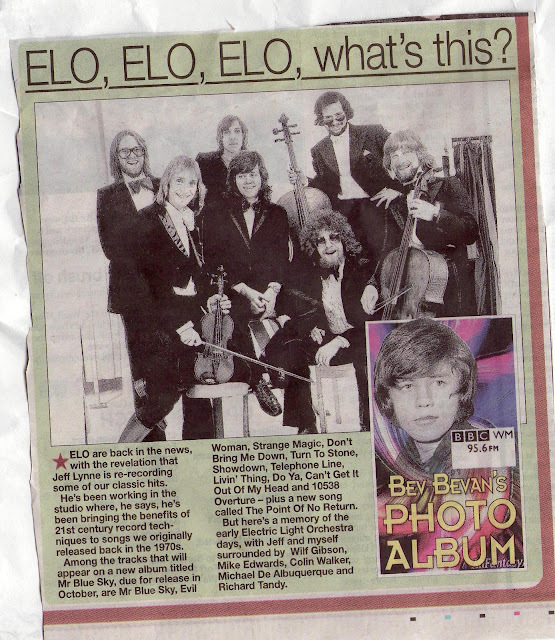 Since 2012 any radio play of ELO songs have been the originals. I remember Jeff said in an interview that he had no intentions of wiping the originals from history, he just wanted another go at them with Todays studio technology.